OxMetrics is a family of software packages providing an integrated solution for the econometric analysis of time series, forecasting, financial econometric modelling and statistical analysis of cross-section and panel data. The core packages of the family are OxMetrics desktop, which provides the user interface, data handling, and graphics, and Ox Professional, which provides the implementation language. The other elements of the OxMetrics family are interactive, easy-to-use and powerful tools that can help solve your specific modelling and forecasting needs. STAMP is a package designed to model and forecast time series, based on structural time series models. These models use advanced techniques, such as Kalman filtering, but are set up so as to be easy to use -- at the most basic level all that is required is some appreciation of the concepts of trend, seasonal and irregular. The hard work is done by the program, leaving the user free to concentrate on formulating models, then using them to make forecasts. Structural time series modelling can be applied to a variety of problems in time series. Macro-economic time series like gross national production, inflation and consumption can be handled effectively, but also financial time series, like interest rates and stock market v olatility, can be modelled using STAMP. Further, STAMP is used for modelling and forecasting time series in medicine, biology, engineering, marketing and in many other areas. The current version Stamp 8.30 has been released in April 2010. The STAMP workpage includes links to interesting empirical research where STAMP has been used. SsfPack is a suite of C routines for carrying out computations involving the statistical analysis of univariate and multivariate models in state space form. The implemented link to these routines is established for Ox 2.0 and higher, the object-oriented matrix programming language of OxMetrics. SsfPack allows for a full range of different state space forms: from a simple time-invariant model to a complicated time-varying model. Functions can be used which put standard models such as ARIMA and cubic spline models into state space form. Basic functions are available for filtering, moment smoothing and simulation smoothing. Ready-to-use functions are provided for standard tasks such as likelihood evaluation, forecasting and signal extraction. SsfPack can be easily used for implementing, fitting and analysing Gaussian models relevant to many areas of econometrics and statistics. The current version SsfPack 3.00 has been released in August 2008. For further information, see the SsfPack workpage. Time Series Analysis by State Space Methods. 2001, with J. Durbin, Oxford University Press. This book presents a comprehensive treatment of the state space approach to time series analysis. The distinguishing feature of state space time series models is that observations are regarded as made up of distinct components such as trend, seasonal, regression elements and disturbance elements, each of which is modelled separately. The techniques that emerge from this approach are very flexible and are capable of handling a much wider range of problems than the main analytical system currently in use for time series analysis, the Box-Jenkins ARIMA system. For workpage of the book, please click here. Time Series Analysis by State Space Methods, Second Edition. 2012, with J. Durbin, Oxford University Press. The Second Edition of the Durbin and Koopman book updates and extends our original treatment of the state space approach to time series analysis. For workpage of the Second Edition, please click here. State Space and Unobserved Component Models: Theory and Applications. Proceedings of a Conference in Honour of James Durbin. 2004, with A. Harvey and N. Shephard, pp. 393, Cambridge University Press. This volume offers a broad overview of the state-of-the-art developments in the theory and applications of state space modeling. 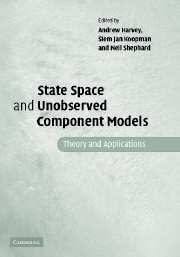 With fourteen chapters from twenty-three contributors, it offers a unique synthesis of state space methods and unobserved component models that are important in a wide range of subjects, including economics, finance, environmental science, medicine and engineering. The book is divided into four section: introductory papers, testing, Bayesian inference and the bootstrap, and applications. It will give those unfamiliar with state space models a flavour of the work being carried out as well as providing experts with valuable state of the art summaries of different topics. Offering a useful reference for all, this accessible volume makes a significant contribution to the advancement of this discipline. An Introduction to State Space Time Series Analysis. 2007, with Jacques J.F. Commandeur pp. 192, Oxford University Press. Providing a practical introduction to state space methods as applied to unobserved components time series models, also known as structural time series models, this book introduces time series analysis using state space methodology to readers who are neither familiar with time series analysis, nor with state space methods. The only background required in order to understand the material presented in the book is a basic knowledge of classical linear regression models, of which a brief review is provided to refresh the reader's knowledge. Also, a few sections assume familiarity with matrix algebra, however, these sections may be skipped without losing the flow of the exposition. The book offers a step by step approach to the analysis of the salient features in time series such as the trend, seasonal, and irregular components. Practical problems such as forecasting and missing values are treated in some detail. This useful book will appeal to practitioners and researchers who use time series on a daily basis in areas such as the social sciences, quantitative history, biology and medicine. It also serves as an accompanying textbook for a basic time series course in econometrics and statistics, typically at an advanced undergraduate level or graduate level. July 1-2, 2013: Keynote speaker at the First Meeting on Time Series Modelling and Computation, to be held at Department of Statistics, Universidad Carlos III de Madrid, Getafe, Spain. June 21-22, 2013: Presentation for A Workshop on Panel Data, to be held at Amsterdam School of Economics Research Institute, The Netherlands. June 15, 2013: Presentation at The Netherlands Econometric Study Group 2013, to be held in Tinbergen Institute Amsterdam, The Netherlands. June 13-14, 2013: Presentation for Jan Magnus valedictory address and conference at Tilburg University. May 30-31, 2013: Presentation at the Conference on Cross-sectional Dependence in Panel Data Models held in Trinity College, Cambridge, UK. May 24-25, 2013: Presentation at the Conference Forecasting Structure and Time Varying Patterns in Economics and Finance organised by Econometric Institute, Erasmus University Rotterdam, The Netherlands. April 15, 2013: Seminar at Laboratoire dâ€™Economie of Universite Paris-Dauphine, France. April 4-5, 2013: Presentation at the kick-off meeting of the Seventh Framework programme of the European Community, FP7, SYstemic Risk TOmography (SYRTO), University of Brescia, Italy. March 21, 2013: Seminar at the Department of Economics and Finance, Institute for Advanced Studies, Vienna, Austria. January 17-18, 2013: Presentation at the Workshop on Dynamic Models driven by the Score of Predictive Likelihoods, Tinbergen Institute Amsterdam, The Netherlands. December 4, 2012: Seminar at Sveriges Riksbank (National Bank of Sweden) in Stockholm. November 16-18, 2012: Invited Speaker at The Third International Conference High-Frequency Data Analysis in Financial Markets organised by Research Unit for Statistical and Empirical Analysis in Social Sciences, Hitotsubashi University, Tokyo. The conference took place at Hiroshima University, Japan. September 27-28, 2012: Invited Speaker at G20 Conference on â€œFinancial Systemic Riskâ€� with Bank of Turkey, in Istanbul, Turkey. July 6, 2012: Seminar at National Bank of Serbia in Belgrade. June 27-29, 2012: Invited Speaker at 18th International Conference, Computing in Economics and Finance organised by The Society for Computational Economics, in Prague, Czech Republic. June 20-22, 2012: Presentation for Fifth Annual SoFiE Conference with Oxford-Man Institute, University of Oxford. May 23, 2012: Seminar for the MMF Workshop on Empirical Modelling of Financial Markets at Brunel University, London. May 16, 2012: Seminar at the Department of Economics at the University of Bath. March 26-28, 2012: Presentation for the 2012 Royal Economic Society Annual Conference at the University of Cambridge. Invited speaker for the Econometrics Journal session Econometrics of Forecasting. March 15-16, 2012: Presentation for 11th OxMetrics Users' Conference at the George Washington University, Washington DC. January 24, 2012: Presentation for Conjunctuurdag at De Nederlandsche Bank, Amsterdam, The Netherlands. January 16-20, 2012: Course on State Space Time Series Analysis at CREATES, Aarhus University, Denmark. December 1-2, 2011: Invited Speaker for the 8th IIF Workshop on ''Forecasting the Business Cycle'' at the Banque de France in Paris and organised by Banque de France and The International Institute of Forecasters (IIF). September 19-21, 2011: Invited Speaker for the SCo 2011 -- 7th Conference on Statistical Computation and Complex Systems, at Palazzo Centrale del Bo, Universita degli Studi di Padova, Padova, Italy. September 1-2, 2011: Presentation for the 10th OxMetrics User Conference, at the School of Business and Economics, Maastricht University, The Netherlands. June 15-17, 2011: Invited Speaker for the Fourth Annual SoFiE Conference at The University of Chicago. May 24, 2011: Seminar presentation at Toulouse School of Economics. February 16, 2011: Seminar presentation at L'Universite Paris 1, Pantheon - Sorbonne. January 21-22, 2011: Presenter at the 7th IIF Workshop on "Flash Indicators", organised by International Institute of Forecasters and others. December 10-12, 2010: Presenter for Invited Session at the 4th CSDA International Conference on Computational and Financial Econometrics (CFE10), University of London. December 1, 2010: Seminar presentation for Faculty of Economics and Management of Leibniz Universitat Hannover. November 29, 2010: Seminar presentation for School of Business and Economics of Humboldt Universitat in Berlin. October 29, 2010: Panel discussant at the Conference L'economia e una scienza? during the Festival della Scienza in Genova, Italy. October 21, 2010: Invited speaker at the "Durbin Seminar", in Honour of James Durbin, organised by UCL, LSE and cemmap, London. October 8-9, 2010: Presenter at the NBER - NSF Time Series Conference at Duke University, Durham, NC, USA. September 26-29, 2010: Invited speaker at the 6th Eurostat Colloquium, on Modern Tools for Business Cycle Analysis: the lessons from global economic crisis, organised by EUI Florence and Eurostat, Luxembourg. September 15-17, 2010: Lecturer "State space time series analysis" for the PhD school at the Department of Statistical Sciences, University of Padua, Italy. September 13-14, 2010: Invited Speaker at the International Workshop on Quantitative Analysis of Energy Markets, Department of Economics, University of Verona, Italy. June 14-19, 2010: Lecturer for the Summer Course "Topics on Forecasting" for CIDE 2010, University of Bertinoro, Italy. June 3-4, 2010: Plenary speaker at the Workshop Industry & Price Forecasting, WIPFOR 2010 in Paris, France. April 9-10, 2010: Invited speaker at the SER 2010, the Biennal Conference of the ANSET-SIS group in Villa Rufolo, Ravello (SA), Italy. March 23, 2010: Seminar presentation for the Federal Reserve Board in Washington DC. March 18-19, 2010: Presentation for 8th OxMetrics Users' Conference at the George Washington University, Washington DC. March 5-6, 2010: Co-organiser and session-chair for 6th ECB Workshop on Forecasting Techniques, "Forecasting: The role of real-time and survey data", at ECB, Frankfurt am Main, Germany. December 18-19, 2009: Invited speaker for the 20th (EC)2 Conference ''Real time econometrics'' at CREATES, Aarhus University, Denmark. December 10, 2009: Seminar presentation for Department of Statistics at the University of Warwick, UK. December 3-4, 2009: Seminar presentation for the International Research Conference on "Macroeconomics of Housing Markets" in Paris, organised by Banque de France, Bundesbank, Banca d'Italia and Banco de Espana. October 29-31, 2009: Invited speaker for the 3rd International Conference on Computational and Financial Econometrics (CFE09) at a plenary session, Grand Resort Hotel, Limassol, Cyprus. October 23, 2009: Seminar presentation for Department of Statistics at George Mason University. October 20-21, 2009: Speaker at the Exploration Workshop II on Financial Risk Modeling organised by U.S. National Institute of Statistical Sciences and U.S. Office of the Comptroller of the Currency in Washington D.C.
October 19, 2009: Seminar presentation for Department of Operations Research & Financial Engineering at Princeton University. September 17-18, 2009: Two seminar presentations for the Department of Statistical Science, Doctoral School, Seminar Program, of the University of Padova, Italy. Here are the announcements for 17 September and 18 September. September 14-15, 2009: Presentation for the 7th Oxmetrics User Conference at Cass Business School, London. August 23-27, 2009: Presentation at Econometric Society European Meetings (ESEM) in Barcelona. Tuesday, August 4, 2009: Course State Space Time Series Analysis in Practice at the Joint Statistical Meetings 2009, August 1-6, a ``Continuing Education'' course, in Washington DC, USA. Friday, June 19, 2009: Seminar for the Department of Economics, University of Verona. Thursday, June 18, 2009: Seminar for the International Conference on Robust Statistics (ICORS 2009), in Parma, Italy.